Not long after I left university I moved to Barcelona with my girlfriend and my brother to found a startup. They were good times, the weather for the most part was a lot better and when it rained, it rained!! The skies would go black and the heavens would open with a torrential down pouring, the darkness broken only by what looked like giant crooked walking sticks of light from the roof of the sky and almost stinging crack of noise as if some monumental whip were being wielded in the sky, followed by a heart stoppingly loud ground moving rumbling. Yeah, really good thunder storms!! The kind of thunder that would have Mark Wahlberg and his Teddy hiding under the bed! Anyway I digress, they were tough times too, and when I wasn't teaching my girlfriend Spanish (and myself patience), coding, or researching, I was cooking us dinner! This sauce, which is ultra quick to make, came to the rescue in all sorts of dishes, including spaghetti, mac & cheese, pizza and, of course, the Great British breakfast. 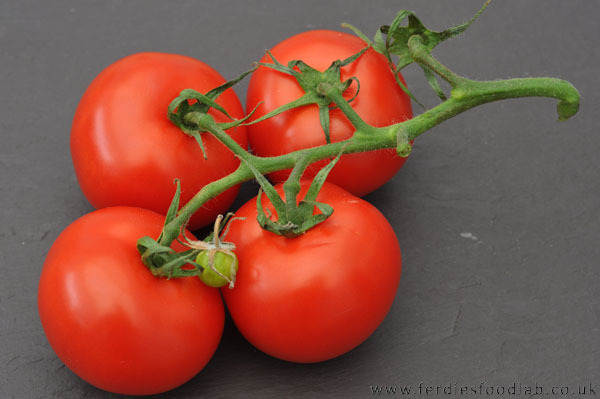 What's good about this recipe is that it's a great way of using up tomatoes that are past their best for a salad, and are really ripe! Chop up the ingredients and put everything except the tomato and stock into the sauce pan on a medium heat, stirring occasionally. Once the onions are translucent, turn the gas up to full blast. After a minute or so add the garlic, then the tomatoes. Take care as it will spit. Mix well, then add the stock and keep the pot on full blast until it starts to boil. Turn down to a simmer immediately and leave for 15minutes or until the tomato has gone soft. Season the sauce to taste. You now have a rustic sauce! I love this on a fry-up!! For a finer sauce simply blend the mix with an immersion (stick) blender - the sauce will emulsify - and pass through a sieve. 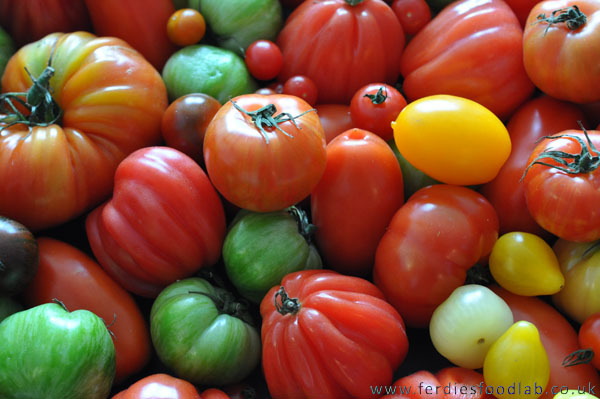 Heritage / Heirloom Tomatoes - The Green Zebras, and the Black Tomatoes are my faves! This sauce will keep in the fridge for a week no problem, and of course there's the old ice cube tray trick. Fill and ice cube tray with the sauce and freeze. Pop it out whenever you need. To be honest it's so easy to make I usually make it on demand. If you're making a fry up, for example, put your sauce on first and simmer it in the background as the rest of breakfast comes together!!! This recipe lends itself very well to being the base for a spicy sauce with the addition of a little chilli. Add basil for spaghetti, oregano of a light mac 'n' cheese or a margarita pizza.